GOSPORT BOROUGH continue their fight for the Southern League premier division survival against Chesham United at Privett Park tonight (7.45pm). Alex Pike expects to give debuts to four new signings and isn’t ruling out even more new arrivals. It is a work in progress for him and he would like some deals to happen a bit more quickly, although the transfer process does take time. ‘I am gradually getting closer to the squad that I want,’ said the Borough manager. ‘Unfortunately when it comes to signing players the wheels turn much too slowly for my liking. ‘We have managed to bring four players in but at the same time have lost others to injury and unavailability. ‘At the moment it seems like we take two steps forward and then two back. ‘When we get the injured players back and the players in that I want then we can kick on. ‘In the meantime we have to keep battling to try and pick up as many points as we can. Joe Lea, Rob Flooks, Stephane Bombalenga and Zak Sharp are all expected to make their first appearance for the club against Chesham. 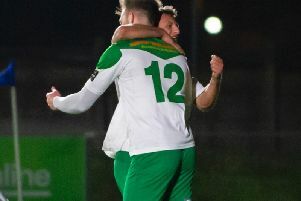 They were due to play at Bishop’s Stortford on Saturday but the game was called off 45 minutes before kick-off because of a waterlogged pitch. Borough will be keeping a close eye on the weather hoping it doesn’t cause another postponement tonight. Pike is hoping the injection of new blood will help Borough turn their fortunes around. After losing their past two games 5-0 Pike is desperate for a vastly improved performance. With so many new players coming into the side much will depend on how quickly they can gel. Pike added: ‘It is all about keeping the hard work going. ‘Our main priority has to be picking up points to alleviate the pressure we are under. ‘We can’t rely on our main rivals Dunstable and have to put our destiny in our own hands. ‘To do that we have to start winning games. The perfect scenario is a good performance and three points. Borough were frustrated not to play at Stortford. Pike agreed, though, that the rain made the pitch unplayable. The manager was determined to take the positives and joked they had enjoyed an unbeaten Saturday. ‘There was a good spirit and atmosphere on the coach on the way back,’ he added. ‘It helped the new players fit in and everything was positive.